Laphroaig lovers gathered in warm spring sunshine to celebrate their love of the cult Islay malt, with four of the distillery’s legendary managers joining in the fun. Dave Broom went along too. The days of taking your life in your hands when walking from Port Ellen to the Kildalton distilleries are over, thanks to the excellent footpath/cycle track which now runs parallel to the road. In fact, the weather was so glorious that I’d have taken my chances and walked anyway. Turning into the woods which shield Laphroaig plunged me into a shaded green world (appropriately enough) filled with the heavy scent of bluebells. Music drifted from the back of a Mundell’s artic lorry as I strolled into an already full courtyard, people wandering through the stalls and food trucks, and queuing with remarkable patience for the dramming station – perhaps the fact that your wristband gave you three free drams (including a wee sensation of this year’s Cairdeas) might have had something to do with it. Smoke hazed across the yard, over people sprawled on the grass, sitting at tables, wandering down to the beach. This being Islay, and this being a cult distillery, there was no shortage of generous sharing of rare drams and, over old bottlings and a rare 30-year-old, I chatted with some of the Laphroaig freaks, wondering what it was about the dram which made it special to them. ‘The raw power of it,’ said one Iggy Pop fan. ‘Put it in Sherry cask and you’re guaranteed a good dram,’ said one, which is a little unfortunate because, later in the day, manager John Campbell revealed that only 20 Sherry casks were filled in in 2015, and none this year. By early afternoon people were ranging ever further away, dots on the rocks that frame the north-east of the shallow bay and, though the music appeared to be getting more energetic, everyone was becoming increasingly chilled. There was less of the crush and tension that you can get at other open days, when everyone is itching to get a bottle. 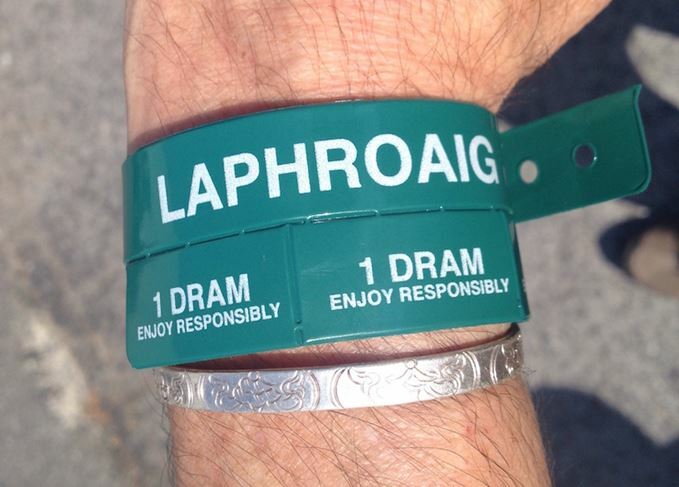 Maybe Laphroaig lovers are simply calmer and more laid-back. There were distillery tours, a vertical tasting, one on maturation, another on Cairdeas and one about ‘the taste’, featuring Select Triple Wood and Lore. There was even one which gave you a taste of the liquid which had been in the casks before they had been filled with Laphroaig, allowing you to compare Sherry and Cairdeas 2014, Port and 2013, and Madeira with this year’s release. The main event, however, was in Warehouse No 1, the old dunnage store that sits on the shoreline and – let’s face it – while drinking a dram in its home distillery always makes things better, drinking it in a warehouse raises the game even further. On the top floor we found four legends of Laphroaig: Denis Nicol, Murdo Reed, Robert Hicks and the current incumbent – or reprobate – John Campbell. All chose a whisky from a decade in which they had worked at, or with, the distillery. Denis had the 1970s, when he masterminded the launch of the 10-year-old; Murdo the ’80s and the somewhat vexed launch of the 15-year-old, with Robert explaining that it had been the most difficult of all Laphroaigs because there was so little stock with the requisite soft flavour profile. Then came John, talking of his days from joining the maltings in 1996 and in 10 years rising to become manager. He took us through the last festival bottling pre-Cairdeas, then came a Cairdeas 30-year-old made up of casks bought by Robert for £2m from broker Jack Ross. It was appropriate to finish proceedings with Lore, that encapsulation of all of Laphroaig’s eras and moods. I walked out into the sunshine, the seaweed, the kiln, embraced by Laphroaig, ready and fortified for the walk home.